Various texts attribute the origin of Indian astrology to various gods and Rishis. It is futile to ascertain who was the originator. The most popularly followed astrological classics today are the ones written by Rishis like Parashara, Varahamihira, Garga, Jaimini and their followers. 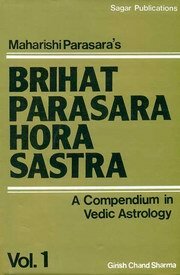 The credit for systematically explaining the entire theory of Hindu predictive astrology goes to Rishi Parashara, in his magnum opus Brihat Parashara Hora Shastra. According to legend he is the grandson of Rishi Vasistha (son of Vasistha's daughter Shakti). He was the father of the legendary Rishi Veda Vyasa (who wrote 18 Puranas including the great epic Mahabharata, which includes the famous Bhagavt Geeta, the Brahma Sutras and the Uttara Mimansa). The depth of his astrological knowledge was so great that, one day while crossing a river in a boat, he casually looked at his favorite stars in heaven, and suddenly realized that it was an exceptionally auspicious moment and if a child is conceived at that moment, he will be an expert in the shastras. So he told this to the lady rowing the boat and requested her to marry him. She agreed and the son born was Veda Vyasa! He also authored Parashara Samhita and Parashara Smriti. According to one theory, Brahma taught the Vedas and Jyotisha to his son Narada. Narada in turn taught these to Rishi Saunaka. Parashara was the disciple of Rishi Saunaka. The Brihat Parashara Hora Shastra is in the form of dialogs between Rishi Parashara and his disciple Maitreya who asks questions and Parashara explain the principles. Even after 5000 years it is still the best classic on astrology!! The rest of the astrology classics are based on this immortal work. Hence it is always advisable and appropriate to start the learning of astrology with this great classic. Before starting the study of these chapters it will be advisable to go through the Introduction to Indian Astrology.